The history of sterilization equipment dates back to the 1680s, however sterilizers did not become popular for practical use until the mid 1800s. Scientists like Louis Pasteur used sterilizers to perform experiments and understand fundamental chemical processes (http://dwb.unl.edu). If you work in an environment with potentially hazardous biological substances, it’s important to understand the basic principles behind the sterilization process. So, let’s start at the beginning! Sterilization is a process that kills all microorganisms. More importantly, one must be able to prove that everything was killed, including highly resistant bacterial spores, before declaring that an object or area is sterile. Therefore, simply wiping a surface with alcohol doesn’t make it sterile. Rather, this type of cleansing qualifies as disinfecting, mainly because there is no way to test or prove that the area is sterile. As we said in our previous article about how to know if your sterilizer works, proper sterilization is a matter of public safety, so it’s important for you to understand how to choose the right sterilizer for the job. What Are the Different Types of Sterilization Equipment? The history of sterilization equipment includes many different types of sterilizers, but there are four main sterilization processes that would be helpful to understand. Autoclaves – Steam Sterilization – Autoclaves are the most commonly used type of sterilizer. 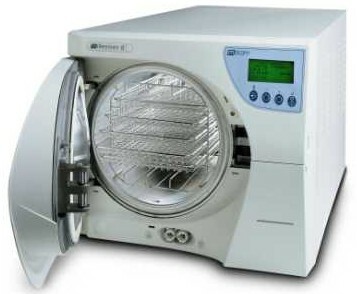 Steam sterilization with an autoclave depends on time, temperature and pressure. It can take anywhere from 6 to 60 minutes for a cycle to complete. The speed of the process mainly depends on the temperature. Higher temperatures create higher pressures and speeds up the sterilization process. Hot Air Ovens – Dry Heat – Dry heat can also be used in sterilization. Dry heat sterilizers operate at very high temperatures, usually 300-375 degrees Fahrenheit, and the sterilization process takes longer, usually 60 to 90 minutes. Dental sterilizers are typically rapid dry heat sterilizers, which can sterilize objects in as little as 6 minutes. Rapid dry heat sterilizers have small chambers, but they are perfect for anyone using small stainless steel instruments. Gas Sterilizers – Ethylene Oxide – For equipment that cannot stand high heat or high pressure, gas sterilization with ethylene oxide is an great option. It’s an overnight process, but it’s a good choice for sensitive lab equipment like endoscopes. Chemical Vapor Sterilization – The history of sterilization equipment includes sterilization with chemicals other than water. These chemicals are less corrosive to the equipment than water, but unfortunately you must dispose of a hazardous chemical when sterilization is complete. No new chemical sterilizers have been made since 2010. Sterilization is an absolute process, meaning your equipment is either sterile, or it’s not. To get optimal results, It’s important to choose the right sterilizer for the job. Sterilizers.com can walk you through the process and help you find a sterilze that meets, but doesn’t exceed your needs. It’s important to choose a sterilizer that fits the size of your facility. We will also help you choose the right process, because this will extend the life of your equipment. We have 30 years of expertise in the sterilization industry and are one of the leading sterilization manufacturers in the country. We can help you complete the process of purchasing a sterilizer from start to finish. Call an expert at 1-877-789-9983 to get started today!